Social media apps may be the cat’s meow, but e-mail is still the reliable Internet communications medium that has stood the test of time. In fact, it was invented at the Massachusetts Institute of Technology (MIT) in 1965 – predating the modern Internet. Now it’s as much of our daily lives as anything else and it has looked the same for as long as anyone can remember. There’s a box to write a subject, a box to write the message, and a place to list your recipients. But Los Angeles-based Bccthis LLC thinks it can make this tried-and-true system even better. 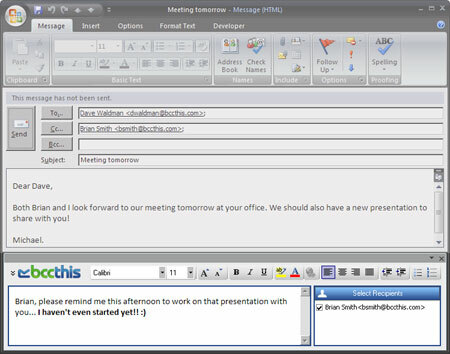 The beta version of the software offers a new way to send e-mail through a plug-in for Microsoft Outlook and an application download for BlackBerry. The new feature added by Bccthis allows a user to reply to a large group of recipients (using “reply all” for example) with one message, while adding a seperate and private message to a specific sub-set of those users. All this is done in one window, and recipients don’t need to have Bccthis installed to receive the messages. The company wants to change e-mail, he adds. No longer is it a one-to-many communications form, but a more relationship-aware and contextual messaging channel. He said sales and human resources professionals in particular seem to find this new functionality useful. Bccthis released its beta Outlook plug-in just a couple weeks ago and it is already seeing 1,000 downloads a day, Waldman says. Many users are finding out about the feature when they receive Bccthis messages, and follow a link at the bottom of the message to the Web site. Users who don’t have the plug-in installed can still receive Bccthis messages. They simply get two e-mails from the sender – one with the private information, and one that was sent to everyone. Those who install the plug-in can choose to receive a consolidated e-mail. But why bother doing this when you could just send a follow up e-mail? Bccthis is available starting today for BlackBerry. Users can download it at bccthis.com and on BlackBerry App World. The application integrates into the existing BlackBerry e-mail client. Users simply hit the menu button and select the “Bccthis” option that is on the same list as “Add Recipients,” Waldman says. Then a seperate screen appears asking who the recipients of that private message are. Users who don’t have the Bccthis app installed will receive two seperate messages — one that contains the private information and the text sent to all recipients, and another e-mail that was sent to all recipients. But recipients who have the client installed will get a single integrated e-mail with all the information. The plug-in is simple to use. After installation, a new pane appears at the bottom of your composition window and you can enter your private messages and choose your recipeints. The window can also be hidden from view. The beta version isn’t without bugs. At first, I had problems installing the software. Once I did get it installed with the help of Bccthis on the phone, another peculiar bug cropped up. When I have a Microsoft Word document open and I open Outlook’s compose window, the Bccthis panel appears in the Word document, and not in the e-mail window. BlackBerry won’t be the only mobile application Bccthis releases. It is looking at doing an Android applicaiton next, Waldman says. 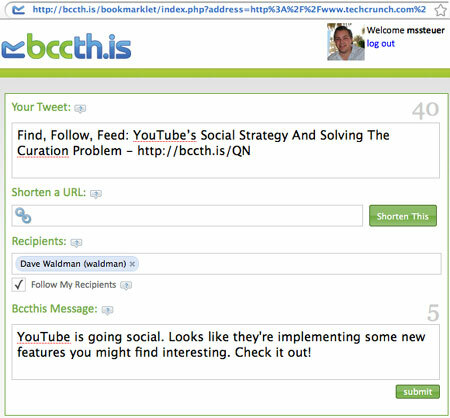 Bccthis also offers a Web-based Twitter client at http://bccth.is that comes complete with a Firefox add-in. The client adds the same concept of the Outlook plug-in to the micro-blogging service. A users can blast out a Tweet to all users, and add a separate private message that is only received by a specific group of friends. That is received as a Direct Message, and includes a link back to the original Tweet. Once you’ve added Bccthis recipients, a seperate window pops up that serves as a private chat group. This allows you to continue a conversation with one user, or a few at the same time, while not sharing your conversation with everyone else. The client is currently seeing about 1,500 users logged on at any given time, Waldman says. Bccth.is isn’t problem free. Because Twitter limits the number of API calls it can receive, not all of your followers will be available immediately as Bccthis recipients. The more followers you have, the bigger the problem, but eventually, all of your followers will be added to the list. Still, it seems this problem could be solved if the user were allowed to manually type in user names as recipients. Bccthis is currently developing an API so the functionality can be built into other Twitter clients, Waldman says. Still, the firm’s focus is primarily on e-mail at this point.